Second, prediction skill in ensemble hindcasts performed with the Climate Forecast System, version 2 (CFSv2), is evaluated with the hypothesis that ENSO is the leading candidate for large and persisting precipitation departures. Third, moist static energy budget diagnostics are performed to identify physical processes responsible for precipitation anomalies. At leads of 0–6 months, CFSv2 demonstrates useful skill in predicting Niño-3.4 SST and equatorial Pacific precipitation anomalies. During El Niño, positive precipitation anomalies along the central (eastern) equatorial Pacific are anchored by net radiative flux (Frad) and moist advection (evaporation and Frad). 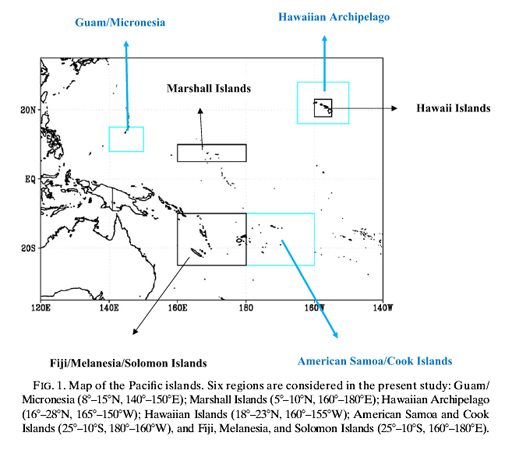 The model’s skill in predicting precipitation anomalies over South Pacific (Hawaiian) islands is highest (lowest). Over the west Pacific islands, the skill is low during the rainy season. During El Niño, skill over the USAPI, in particular predicting dryness persistence at long leads is useful. Suppressed precipitation over the Hawaiian and South Pacific (west Pacific) islands are determined by anomalous dry and cold air advection (reduced evaporation and Frad). These processes are local, but are dictated by circulation anomalies forced by ENSO. Model budget estimates are qualitatively consistent with those obtained from reanalysis, boosting confidence for societal benefits. However, observational constraints, as well as budget residuals, pose limitations. Disclaimer: These forecasts are experimental and are not official NOAA products.